How do we recognize the energy that connects and propels us? Is it the technologically produced electricity that is transmitted through transformers and grids, powering our homes, offices, and social lives? Or is it the physiological system of impulses produced by the network of billions of nerve cells in our body's circuitry? Should it be considered parapsychic and unknowable, a life force that connects us to each other, to our ancestors and descendents, and to the earth? Tethered is an installation that encompasses all these possibilities. A series of wire grids encrusted with salt crystals hangs from the ceiling. A knotted umbilical white rope cascades from the ceiling, gently unfurling and unraveling. Exposing hundreds of neuro-dynamic tendrils, they weave their way through the grids, entwined in the sparkling salt crystals. Upon reaching the bottom of the grids they pool on the floor. 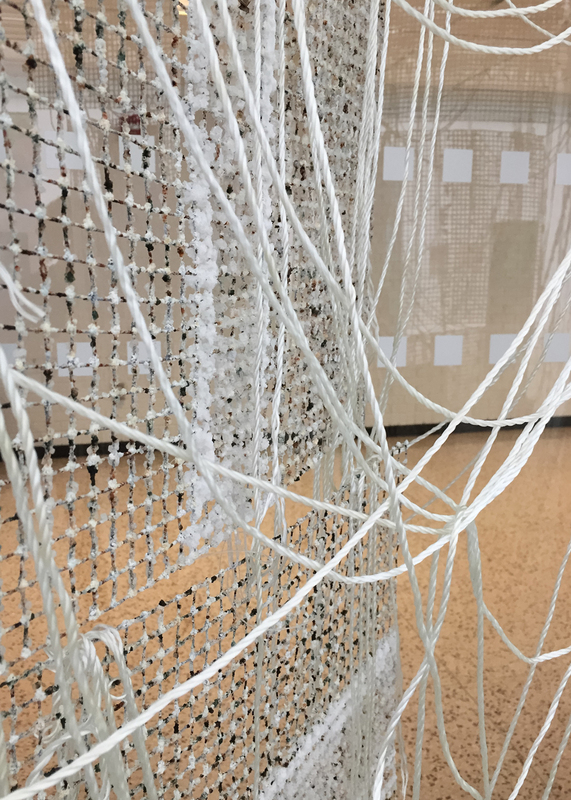 Tethered is a meditation on life – tangible and ethereal, and on the energy of connection.